The Holiday House: In the Middle of it All! ACCEPTING RESERVATIONS FOR SUMMER 2019! CONTACT US TODAY! 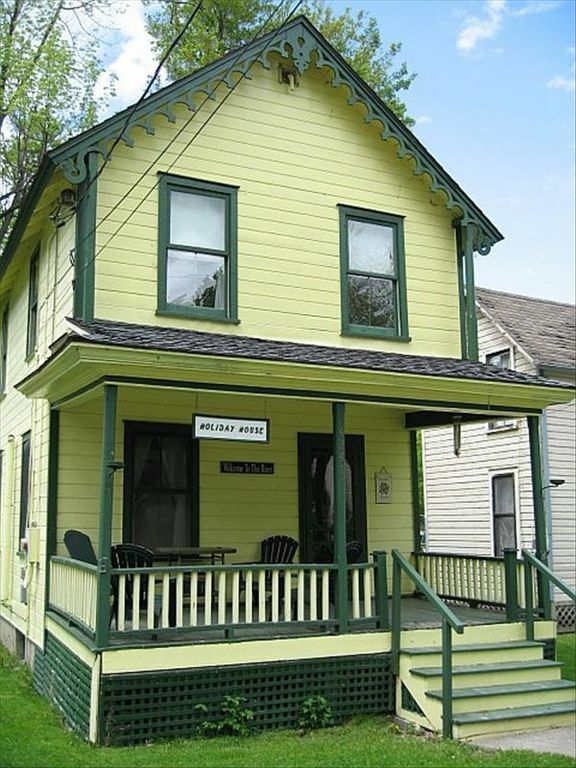 This 19th century Victorian Cottage is centrally located in the middle of the historical district of Thousand Island Park. Access to all the Park's amenities such as the Playground, Main Dock, Wellesley Hotel Restaurant & Pub, The Guzzle, Grocery Store, and Library are just a yell away. Enjoy all the amenities of home and an extremely spacious interior. Downstairs includes the living room, dining room, family room (with 40' flat screen HD TV), large kitchen, half bath, and two porches. Upstairs are two full baths (one with laundry), four bedrooms (two queen beds and two full beds), and an office. The cottage is very functional with River-themed decor and wainscoting throughout. For those with small children looking for a place to swim, 'The Cove', is less than a 5 minute drive. You'll love the sandy bottom and all the sand to play in. The Cove has a raft to swim out to not to mention a beautiful view of Rock Island Lighthouse and the seaway. It's a fun spot to swim, play, and watch river-life go by. This property is well maintained and well loved! Get ready to relax...you're at the River! Wireless Internet, Cable TV, and landline provided. Bath and bedroom linens are not provided. Cleaning and TIP fees are separate from rental fee. Holiday House is an excellent choice! We made an excellent choice in renting this cottage! It was super clean! I did not have to clean when I arrived. The cottage is just as described in the photos. Very roomy 1st floor...plenty of space for everyone to spread out and be comfortable. TIP had a power outage due to a large thunderstorm and within 2 minutes, the owner was texting me, telling me where they kept the flashlights, candles and lighter! Great location too! Just a block from the park, playground and the Guzzle! So convenient. The owners are a pleasure to work with! If you are undecided, rent Holiday House! You will not be sorry! I grew up camping at the State Park on Wellesley Island. This summer my siblings and I all brought our families to Thousand Island Park and rented 4 cottages. My family stayed in the Holiday House and it was great. It is in walking distance to everything there is to offer in TIP. We were pleasantly surprised by the size of the work area available in the kitchen, it was perfect to prep meals in for the extended family. The living room is also quite spacious and the wainscoting throughout the house really reminds you that you are in the up in the islands. The bathrooms were also all quite large and well equipped which is sometimes not the case in cottages. The owners are fabulous... responsive, easy to work with, and genuinely concerned that everything went well. We would definitely rent this home again on a return trip to the islands, one of our favorite places!